Treloar named in league's best On the back of being named in a 40-man All Australian squad, watch the best highlights of Adam Treloar's debut season at Collingwood. After played 22 games and winning a new army of fans, Adam Treloar has finished his first season at Collingwood as the winner of the R.T Rush Trophy. The hype surrounding Treloar’s move to the Holden Centre was enormous, and it was going to take something special for him to live up to the expectations. Fortunately, he did all that and more in a year that saw him nominated in the AFL’s 40-man All-Australian squad. He played all 22 games, leading the club for disposals, tackles, clearances, inside 50s and bounces, and establishing himself as the key ball winner. Treloar stamped his authority on the club and the competition at large with an outstanding performance in the round one drubbing against Sydney. He won 34 disposals and six clearances in an 80-point loss, following it up with a further 32 in the pressure-packed win over Richmond. The 23-year-old rarely let up, winning 30 or more disposals on 13 occasions throughout the year. He also hit the scoreboard 31 times, kicking 13 goals and 18 behinds. 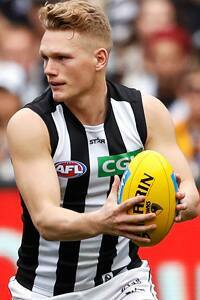 In finishing second in the best-and-fairest, Treloar fell just short of becoming the first Magpie to win the Copeland Trophy in his first season at the club since Nathan Buckley in 1994.